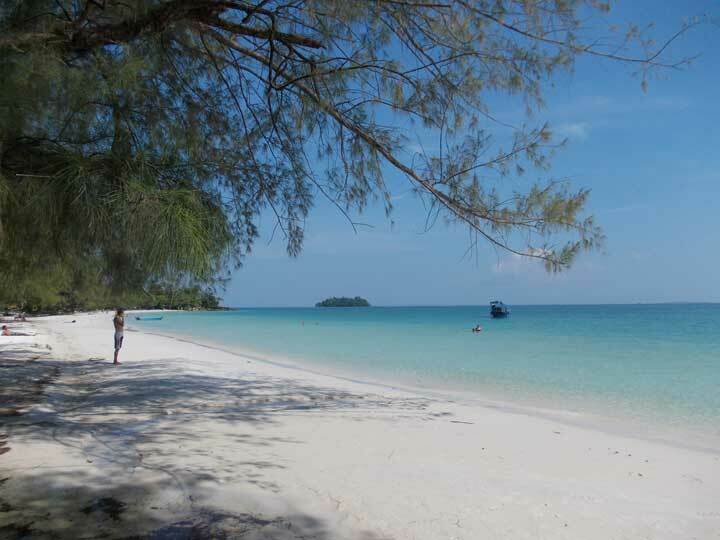 Welcome Koh Rong Island travel guide, info & book accommodation. The #1 web site! 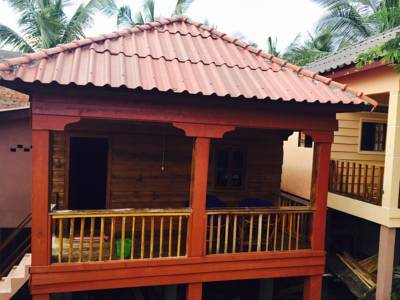 You can easily book accommodation koh rong, koh rong samloem, koh kong island, koh ta kiev, sihanoukville and accommodation siem reap. 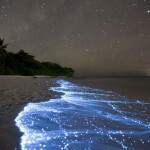 Discover koh rong, best cambodia islands!!! If you go now in Koh Rong, you are lucky, because you can enjoy the half desert island, with few people, live with people of villages, so have really relax time; nojust some raw roads and no cars, no traffic!!! At the moment there are only few accomodation with bungalows or rooms, but the future will not be the same like now! So take the time to come here now!!! (the speedboat from sihanoukville takes 45 minutes). There are no roads, but only beaten tracks, you can walk into the amazing jungle or reach the beach you prefer, so only by foot or by boat!!! So we think there are many reasons to come here!!! 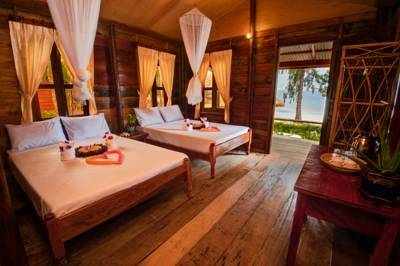 Find your accomodation, rooms, bungalow, guest house Koh Rong Island – Cambodia. 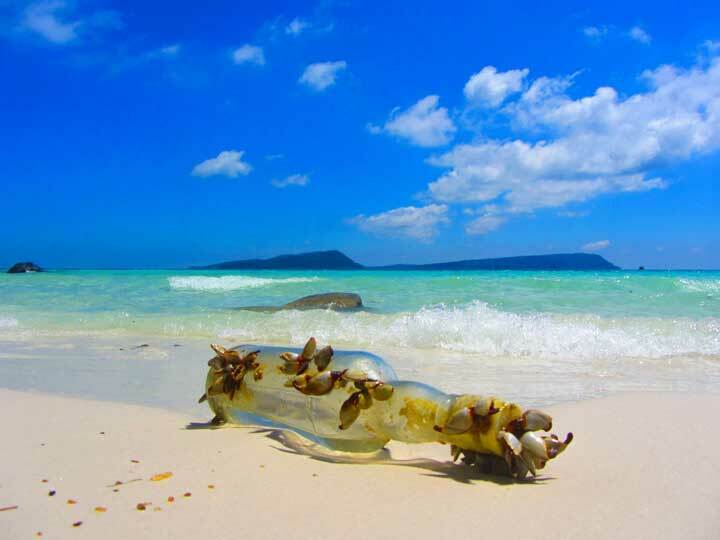 Koh Rong is a new few tourist, backpackers island, undeveloped for years. You find paradise beaches, bungalows and good places for snorkeling. In late 2010 and early 2011, a number of new operations opened up, as well as regular boats to the island. Since late 2012, more accommodation has been built and an increasing number of visitors have been discovering the beauty of island life here. But with still only 18 sets of bungalows on the island at the time of writing in early 2013, it still has a near-deserted feel to it with just enough going on to make it comfortable. There are seven bays on the island, you can do snorkelling and diving. The most cool Song Saa Resort is to the north of the island, but you can find cheap accommodation. You also can do trekking, diving, snorkeling and relax!!! On the island you can find small shop, laundry services and a good small restautants, but there isn’t ATM! Most tourists near to the village are mostly backpackers and divers.Inside the island is reallyundeveloped andif you wanna go from a beach to an other you need to walk or go by boat. 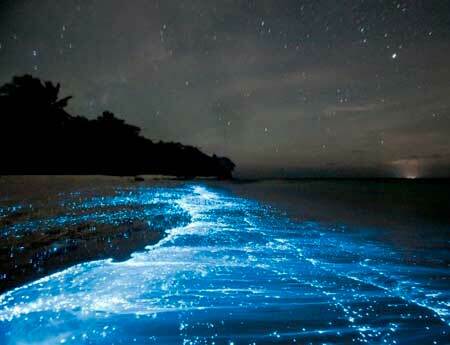 Amazing beach is called Long Beach, you must try, or by trekking or by boat and try the 7 km long white beach!!! We suggest to book your rooms before departing, look on koh rong accommodation page book soon bungalows or resorts . 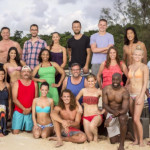 Remember that is a half desert island so is not for all kind of tourist, is an adventure style island!! !But it will be an amazing experience. On desert beaches like koh rong you can find sand flies. They can bite you , and leave marks that can irritate for days. You can use a strong repellent, by the way i never bitted!! Being an hal desert island there are not medical care. news: speed boat to koh rong and koh rong samloem available now!!! 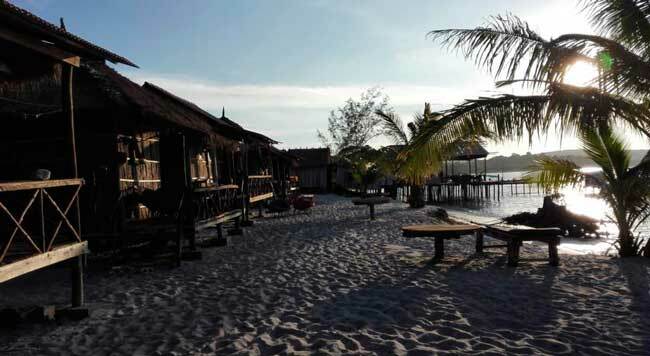 If you are planning your next holidays in Koh Rong Samloem, here you can find the complete travel guide and website and also accommodation & bungalows for your next travel to Koh Rong Samloem: CLICK HERE – We offer cheap price on Koh Rong Samloem Bungalows and accommodation , check it now this cool website! 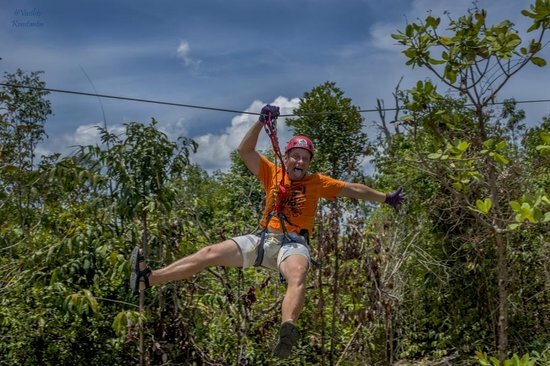 High Pont Rope Park is a new amazing activity to do in Koh Rong, is an adventure Zip Line built over 23 trees!!! Is really a big project as number says: total length of the stages are more than 400 meters; maximum height steps more than 20 meters; longest bridge is 44 meters; longest zip line is 120 meters !!! Is it enough?! 🙂 There are two zip line courses and you will fly into the jungle at heights of up to 24 metres!!! Prices are different from season: during the low season, (April 18th to October 18th) the price is 25$ per person. During the high season, (October 19th to April 17th) the price will be 35$ per person. The price includes: Hire of all necessary safety equipment, the first time round the course under supervision of Guide/Instructor, and then an unlimited number of independent goes after that on the same visit. Diving: You can find any kind of SCUBA diving trips with partner operates on the island. Snorkeling: We offer snorkeling trips on an individual and spontaneous basis, see also paragraph: “Island hopping and archipelago exploration” On board a boat or the approach on foot – just the classic beach walk and occasional hop in’s. We have really good equipment and know the best spots. Trekking: Explore Koh Rong’s jungle. Enter untouched island rain forest guided by Gil, our Trekking and Cycling expert. Get ready for shady hours under the jungle’s canopy, hug mighty mahagony trees. Animals you might spot: Macaws (monkeys), Toucans (Hornbills), Fishing Eagle, King Fisher, reptiles, great variety of insects and more. 1 day Jungle trekking with a variety of possible destinations (villages, waterfalls, empty and natural beaches). Overnight trekking with an evening among local people and accommodation in the village at the far end of the island. Cycling: Enjoy 30 km of the challenging dirt road trail with stops and breaks at empty beaches, fishing hamlets and fisher’s hangouts. The trip leads you through alternating terrain. Choose a one day trip or an overnight trip – we value your ideas and inspirations. Island hopping and archipelago exploration: This includes any boat chartering activities in a little restricted sense, such as: Speed boat rental, slow boat rental, island round trips, snorkeling trips, sunset and dinner trips. So far there is no professional commercial tour boat operator based in or around Koh Rong, which means that most tours are greatly influenced by our guest’s ideas. Needless to say, it can’t get any better and most people return with a super-satisfied/laid back attitude and this mystical smile, indicating that this day was for the very soul. Fishing: Charter a boat or from shore – you can hook up with local experts – increasing your chance of success. We have a “great spot” oracle, too. Massage & Wellness: We have a local masseuse, who performs full body massages. In best local tradition she aims at the client’s wellbeing and relaxation rather than the therapeutical thing or concentration on spot treatment and pain relief. 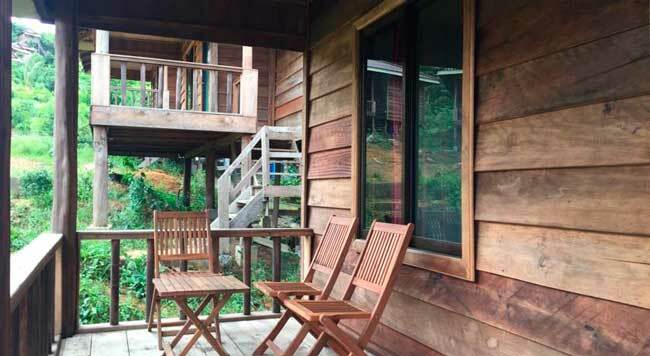 ACCOMODATION KOH RONG, BUNGALOWS,RESORT,ROOMS,GUEST HOUSE: GO TO ACCOMMODATION KOH RONG page! 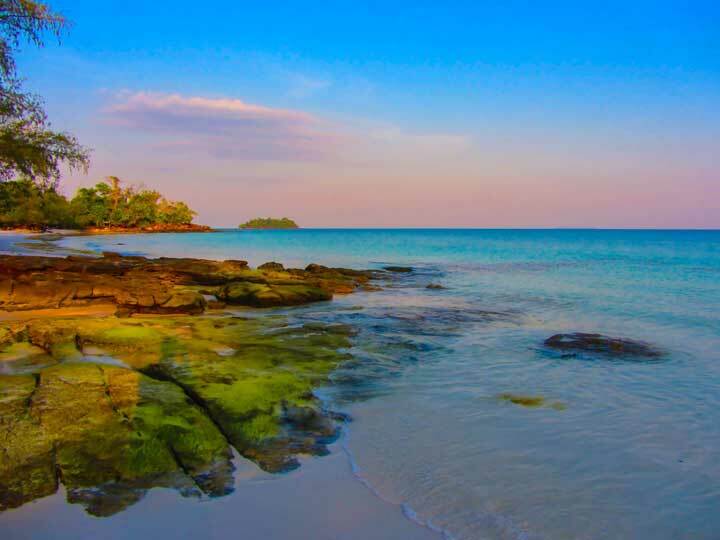 CLICK HERE BEST CAMBODIA ISLANDS!!! Prenota il tuo prossimo Viaggio in Thailandia con la guida completa in italiano, ultime notizie sulla Thailandia, le destinazioni top, hotel e molto altro per le tue vacanze in Thailandia!! !